I) The minimum to know to start your first board. Must commit to the performance of a contract. There are four players. You (still south) and 3 other simulated by the computer. North-South team against an East-West team. Distributed 13 cards per player for a total of 52. For each suit: Ace King Queen Jack 10 9 8 7 6 5 4 3 2. The suits have the following increasing order: notrump. We do not count points but the number of options exercised by party: 13 tricks possible to divide between the 2 teams. Call the dealer (it is randomly selected by the software). It is "PASS" or he bid. In this case the bid must be greater than the last bid. The floor suite at the nearby player and so on. The last bid will contract to perform. Must be able to determine the total strength of the cards in a side. This strength to commit themselves to a number of tricks to the trump or notrump . To bid, we have 4 suits ( ) and notrump (which implies that none of the four suits has priority over the others, so we can not ruff). We are not talking of the first 6 tricks. The auction spread 1 , 1 , 1 , 1 , 1NT, 2 until 7NT. - say 7 notrump (7SA) mean that promises to at least 13 tricks. Slam: a contract at the six-level (small slam) or seven-level (grand slam). DOUBLE: challenge in which a side is committed to fall chosen by the other side contract. Consequence: if the contract go down, the value of the down is higher. If the contract makes, the gain value increases. REDOUBLE: weapon used by the side doubled if he thinks fulfill his contract. At this time, win or down are even stronger. DOUBLE and REDOUBLE are not blockers. If players wish, a higher bid removes double. The suit of the contract defines the trump (ie 4 = 10 tricks to trump ). The declarer is the player who announced the first suit of the contract played by his side. To start the game, the player to the left of the declarer places a card on the table (he opening lead). The partner of the declarer is called dummy. He spreads his game on the table after the lead. The player placed before dummy. Each in turn plays. Players are required to follow the requested suit (if they have). This is the highest card wins the trick, if ruffing the highest trump. No obligation to climb or ruff on the suit. If you do not have the required suit, we can discard (provide another suit) or ruff (with the trump) if desired. At notrump, you can not ruff it. Each player in turn provides a card. 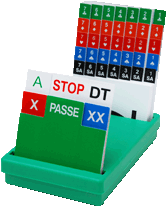 The trick consists by 4 cards on the table, it is won by the player who provides the highest card. It will be the player to replay for the next trick. The vulnerability is fixed before each hand: a vulnerable team (symbolized by two small red triangles) have a higher bonus for the contract success or a higher penalty for defeating. A not vulnerable team is symbolized by two small green triangles. From now on, you will be able to move very quickly, you are in possession of sufficient evidence to play. The software is there to guide you in the right path automatically. You will discover, as you, the finer points of playing your first party. 6 tricks + the contract level. Example: 3 = 9 tricks in trump . Calculated by the software, but it is important to know to determine your strategy. 1 = 70; 3 = 140; 4 = 420; 5 = 400; 6 = 920; 6 = 980; 3NT = 400; 4 doubled = 590. A undertrick is from 50 to 300 points according against, and vulnerability. Figures or honors have a value: Ace = 4; King = 3; Queen = 2; Valet = 1. The openings are from 12 points. ABSOLUTE PRIORITY: Check if you have 5 cards or 5 cards : if yes, open 1 or 1 is the MAJOR FIFTH; otherwise, open 1NT with 15-18 points HCP without long suit. If you can not open 1 or 1 , or 1NT, open 1 or 1 . Major suits: / minor suits: . Respond: respond from 5-6 points. The ABSOLUTE PRIORITY: find 8 cards or 8 cards in your side (5 +3 or 4 +4, 6 +3 ...). From 20 to 22 points of honor (HCP) in the side, it is theoretically possible to make 7 tricks, from 23 to 24: 8 tricks, from 25 to 26: 9 tricks, from 27 to 29: 10 tricks, from 30 to 32: 11 tricks, from 33 to 36: 12 tricks, and finally more than 37: 13 tricks.